As we anticipate warmer weather while we brace ourselves and loved ones in these cold months, camping season is approaching. We all know what we normally pack, but when you actually look at what you bring for food and the nutritional values associated, its plain to see we just arenâ€™t eating right while around the campfire. CSU Recreational Centers Outdoor Clubâ€™s Leif Mattern explained some healthier food choices to make while packing for an adventure. â€œFor breakfast foods, I would say plain oatmeal with a little brown sugar or dried fruits would be great,â€ Mattern said. These foods are easier to pack and are definitely filling, giving you energy for your entire adventure. For dinner, Mattern says rice with any kind of sauce and vegetables are great for you, and the rice can be substituted with quinoa. â€œA lot of people think that just because youâ€™re camping, that you are restricted to dried packaged foods. The truth is you can be pretty creative with meals, just like you are at home,â€ Mattern said. He also explained that you can stick with diets but remember to remain conscious of the weight of materials, as you will be carrying them around with you. Canned foods are better than jars because they weigh less and you can bring vegetables and fruit with you. One food group to stay away from is meat. Bacon and other meats attract bears and other animals to your camp. â€œAlways remember to practice bear safety. Storing food properly in bear proof containers away from where you sleep. Bacon is tasty, but it stinks to high heaven and the smell will remain on your clothes.â€ Definitely not a good idea if youâ€™re camping in backcountry. With these tips, you should be well on your way to surviving and thriving while having a great time travelling and camping. Bacon, or its non-meat substitute for our vegan, vegetarian and non-pork loving friends, is a salty, sometimes crispy, treat craved by all bacon-lovers. It is incredibly versatile in the kitchen and can be added to almost any dish. From appetizer to dessert, here are a few dishes featuring bacon. 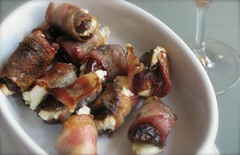 A date is a soft, sweet fruit that grows on some species of palm trees, and they go wonderfully with bacon and cheese. First, preheat the oven to 350 degrees Fahrenheit. For the dates to cook evenly, place the rack in the center of the oven. Take your dates and stuff them (where the pit used to be) with cheese, then wrap a piece of bacon around the stuffed date and secure it with a toothpick. For easy cleanup, cover a cookie sheet with tinfoil before placing theÂ the wrapped dates on the cookie sheet; position them far enough apart so they will not touch. 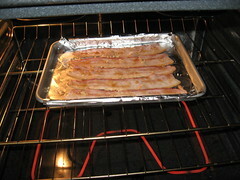 Bake for 20-25 minutes or until the bacon is crispy, then remove from oven and let cool for 10-15 minutes. Place the dates on a plate and sprinkle cheese around them, then drizzle lightly with balsamic vinaigrette. Note: Any vegetables can be used for this recipe. First, start soaking the skewers in water. They need to soak for about 30 minutes so they don’t catch fire on the grill. While they are soaking, cut up the veggies and meat. Once cut, slide each piece onto a skewer, alternating between veggies and meat. Try wrapping some of the veggies in bacon; make sure to skewer both sides of the bacon so it stays on. Leave an inch or two at either end of the skewers to allow for easy handling. Also, leave space between each item so they cook evenly. Grill the kabobs on a barbeque grill until the chicken and bacon are fully cooked. Allow time to cool, and enjoy. We are going to bake the bacon first, so preheat your oven to Â 350Â° Fahrenheit with the rack in the middle. Cover a cookie sheet with tin foil. Lay the bacon on a cookie cooling rack and place it on the cookie sheet. Cover each slice of bacon with an even layer of brown sugar, thick enough so that you cannot see the bacon underneath. Bake for about ten minutes until the sugar is caramelized and the bacon is almost crispy. Flip the bacon over and coat the other side with brown sugar as well. Bake for another 4-6 minutes until the bacon is fully cooked. Let the bacon cool for 10-15 minutes to let the sugar harden. Then, cut or crumble the bacon into small pieces and sprinkle over vanilla ice cream with some more brown sugar. Enjoy!